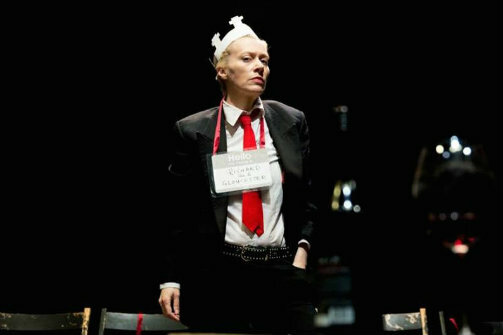 Emily Carding in Richard III (a one-woman show). Photo by Manuela Giusto. This highly-condensed version of Richard III begins with the Duke herself (Emily Carding) helping audience members to their respective seats and assigning them the other roles of the play. That’s right—we make up the English court in this modernized interpretation of Shakespeare’s tragedy. A very minimal production, the set consists only of a single black rolling office chair, a table with a glass of wine, a prayer book, little stickers with the word “DEAD” scrawled on them in red marker, and the chairs that audience members sit in. This is Richard III stripped down to its barest element—the connection between audience and actor. Despite her talents, Carding is presented a challenge by such an intense breakdown of the fourth wall. The play has a rocky lift-off, with audience members potentially wondering how much participation is too much participation. At times, it feels like Carding is dragging us along in the play rather than taking the journey with us. As the show goes on, Carding manages to navigate these awkward moments with precision and grace—likely due to the audience members easing into their roles. Her Richard is charming, sinister, conniving, guilt-ridden, and utterly pathetic all at once. This performance is everything that we would want of one of the bard’s greatest villains. Richard III (A One Woman Show) is by William Shakespeare and adapted by Kolbrun Bjort Sigfusdottir and Emily Carding. Directed by Kolbrun Bjort Sigfusdottir. Props and Poster Design by Emily Carding. The cast is Emily Carding (and the audience).